Water levels in the dam rose 4-to-5 feet (nearly 1.5 metres) overnight. 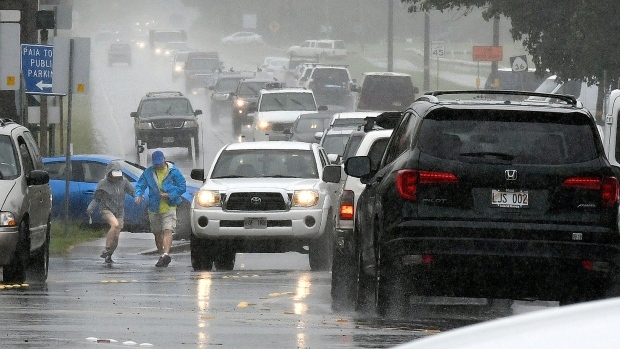 Meteorologists downgraded the storm to a tropical depression as it moved away from the islands and warned lingering moisture could bring more rain. Plans call for a mandatory evacuation if the water reaches 1 foot (30 centimetres) under the top of the dam, Lau said. The water was 5 feet below the top of the dam on Thursday. It was also 18 inches (45 centimetres) below a spillway. Areas downstream would flood if water goes over the spillway, Lau said. The dam is Nuuanu Dam .1, a reservoir built in 1905 in a residential neighbourhood near downtown Honolulu called Nuuanu. It has the capacity to hold 21 million gallons (80 million litres). Lau said workers began siphoning water away from the dam before Olivia reached the islands. But these efforts were unable to keep pace with the 7.3 inches (18 centimetres) of rain that fell in Nuuanu during the storm. On Thursday morning, Lau decided to begin pumping water out of the dam with the help of Honolulu firefighters. Sherwod Chock, an artist who has lived in the neighbourhood for nearly 50 years, said officials have never warned about high water levels in the dam before. The dam is one of multiple dams in Nuuanu that are used for flood control. Water levels at a bigger dam, Nuuanu Dam .4, are much lower. This dam also has an additional method for releasing water in a controlled fashion that Nuuanu Dam .1 lacks.